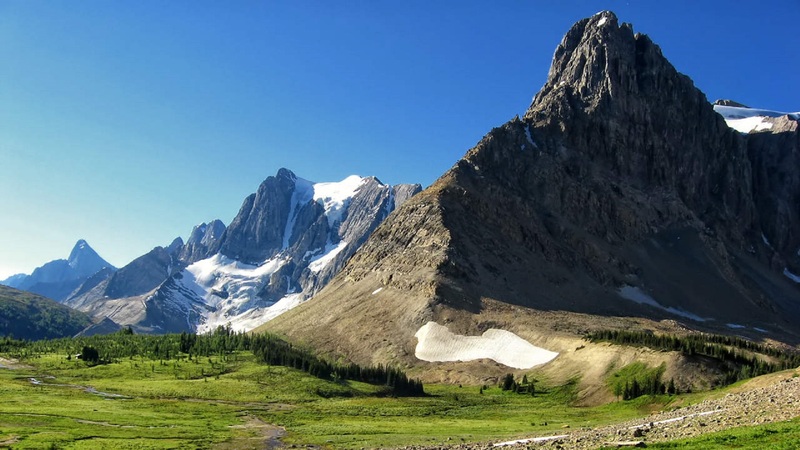 Amazing and improbable as it is, Howse Pass is one of the gentlest crossings of the Continental Divide in the southern Canadian Rockies, yet somehow it has managed to escape the fate of other passes in the region. No road or rail line disfigures it. This despite its favourable geography, at first, for a transcontinental railroad (it was CPR surveyor Walter Moberly’s chosen route, rather than Major A. B. Rogers’ successful recommendation of Kicking Horse Pass), and in more recent times, for a fourth major highway across the Divide between Alberta and British Columbia. Intense lobbying by central Alberta chambers of commerce for an extension of the David Thompson Highway between Saskatchewan Crossing and Golden (to save commercial traffic a couple hours of travel via Calgary) was, happily, unsuccessful. In the twenty-first century, however, Howse Pass could barely lay claim to a discernible footpath, let alone any sort of road. An ancient trail across the pass, linking the Columbia and Saskatchewan River basins, had been allowed to deteriorate to the point that bushwhacking was often the easier choice. 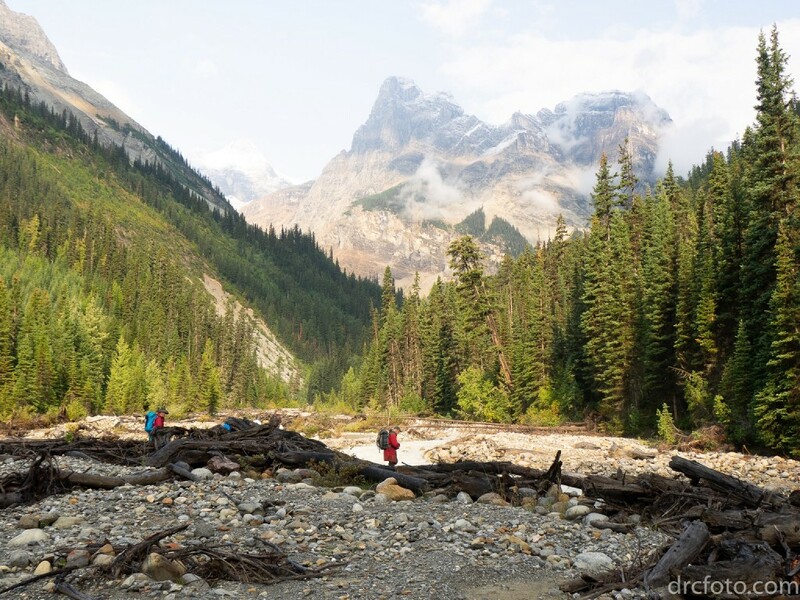 Despite being a crucial link on the Great Divide Trail between Yoho and Banff National Parks, relatively few thru-hikers attempt the route, many preferring to bypass the area by way of the Icefields Parkway. It wasn’t this way historically, though. Archaeological evidence shows that the connecting river valleys on either side of the Divide, the Blaeberry in present-day British Columbia and the Howse in Alberta, hosted a substantial traffic of Ktunaxa (or Kootenay) people from west of the mountains, who established the trail and travelled the route for centuries, hunting bison on the Kootenay Plains and trading with other indigenous groups. The first European to cross the Divide here, “The Great Map-Maker” David Thompson, walked the trail in 1807 on his journey to the mouth of the Columbia River, hoping to establish it as the primary trade route between fur-trading posts on the prairies and forts along the Columbia and Pacific coast. In this he was thwarted by the plains-based Piikani (or Peigan) people, who were accustomed to having control over the Ktunaxa’s access to European trade goods, most importantly firearms (This would not be the last trans-Rockies commercial dispute!). 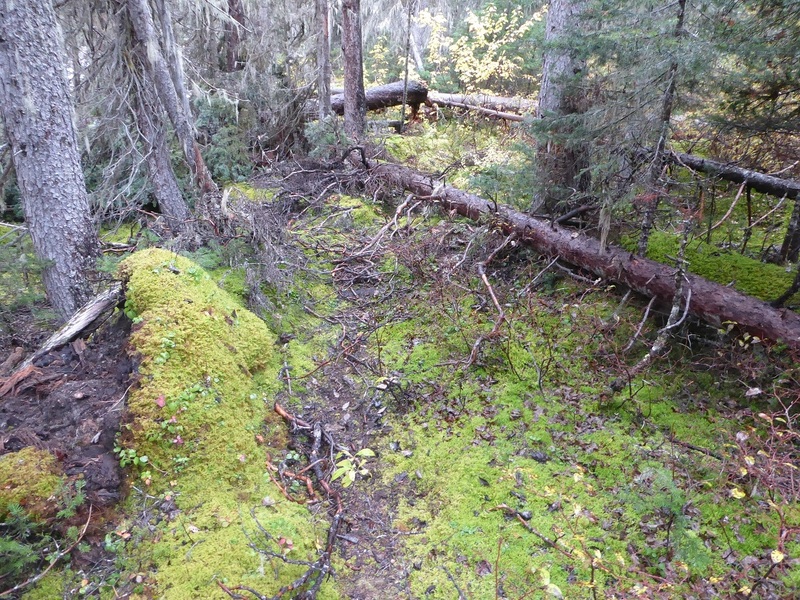 The Piikani effectively blocked access to the pass and, ultimately, by 1811 it was abandoned by the fur traders in favour of the more northerly Athabasca Pass. A very good story! 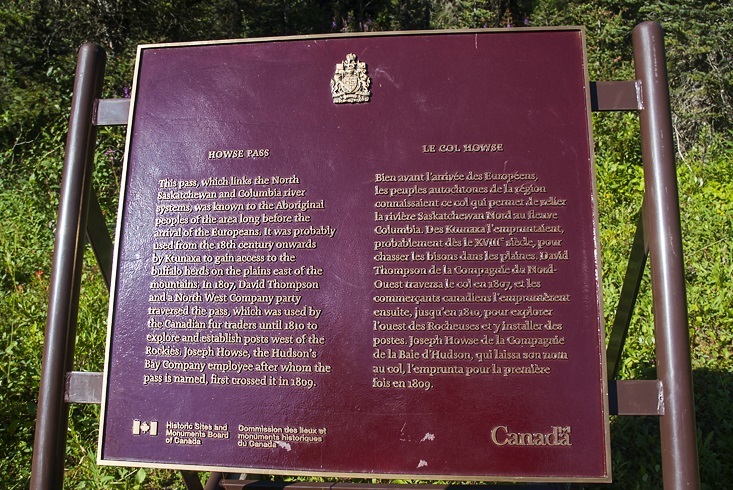 Good enough for the Canadian government to designate Howse Pass as a site of national historic significance, but, sadly, not good enough to provide for any possibility that Canadians (or others) might actually want to visit the site. So the intrepid hiker with an abiding passion for Canadian history has been faced with the choice of a 13-km slog through the almost impenetrable upper Blaeberry, with choking undergrowth throughout, many washed-out sections and two treacherous glacial creek crossings … OR an ordeal twice as long up the Howse River valley, with literally hundreds if not thousands of blow-downs to crawl under, over or around. But wait, it gets even better – a combination of both for the hapless GDT thru-hiker! 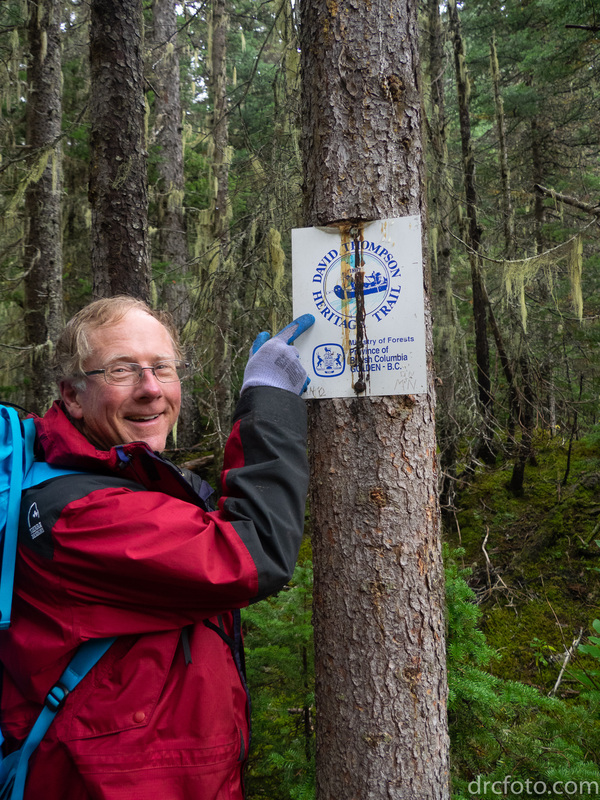 Full marks to the BC government, however, for recognizing the value of their portion of the route and designating it the David Thompson Heritage Trail. This acknowledgement was accompanied by the last recent maintenance work, carried out in 1993. The trail was cleared of brush and deadfall, both creeks bridged, and signs erected. 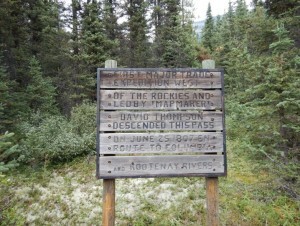 The access road from Golden was even in driveable condition all the way to the David Thompson trailhead at Cairnes Creek. Alas, the Blaeberry valley is renowned for its vegetation producing capabilities and before long the trail was becoming overgrown and obstructed once again. A knockout punch was delivered in 2013 when severe flooding destroyed the bridges and the raging river carried away entire sections of trail. 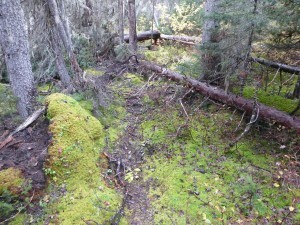 The access road suffered the same fate, rendering impassable the last 14 kilometres to the trailhead. 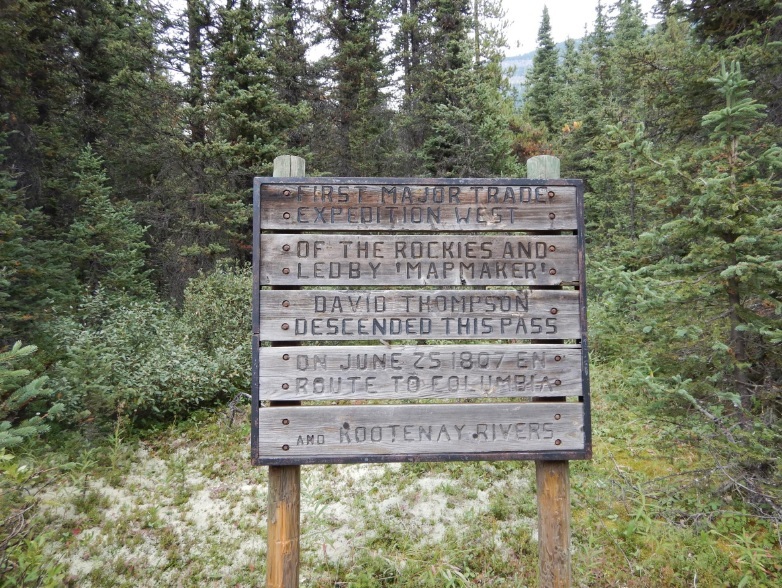 At this point the David Thompson Heritage Trail began to literally disappear from the landscape. The story on the Alberta side, in Banff National Park, wasn’t much rosier. Flooding didn’t affect the trail so much as official indifference; Parks officials decided the Howse Pass trail was no longer deserving of attention, and that it would be left to revert to a natural state – i.e. to disappear. Strong winds, not unheard of on the eastern side of the Divide, seemed to be in agreement with this strategy and long stretches of the trail soon resembled a giant’s game of pick-up-stix. That pretty much sums up the situation GDT hikers faced by the summer of 2018 – at least those brave (or foolish) enough to attempt the Blaeberry/Howse Pass route. Enter the GDTA! Over the past several years our organization has been cultivating relationships with government departments, private companies and individuals, and other volunteer groups. 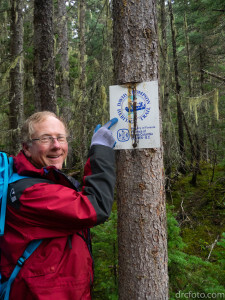 The short-term objective is of course to get the Great Divide Trail completed to an acceptable standard throughout, but as experience has shown, trails need ongoing attention to keep them in usable condition, and partnerships are an essential element in the success of this effort. So bridges need to be built not only over creeks and rivers, but also between the GDTA and myriad other parties who have an interest in the places traversed by the Trail. 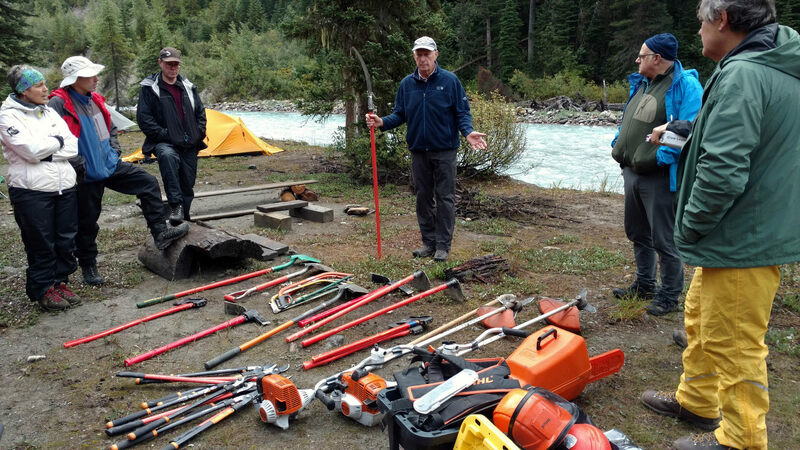 This bridge-building effort has resulted in several successful trail restoration events recently, one of the most recent being on the David Thompson Heritage Trail. I’ll let you know how that trip worked out in the next edition of the Pathfinder. Stay tuned!